SHOW ME – Why Buy? Stock Fairing Vents eliminate Buffeting but expose rider to Stinging Insects! This is a screenshot taken from a YouTube internet public presentation. Motorcycle Vent Screens is in no way associated with the movie. Side Vents direct Road Debris & BUGS at Riders upper torso and neck areas! Side SPLITSCREENS preventing Large Insects and debris from striking Rider! "Clear path" Center Vent "aims" Road Debris & Insects at Riders neck and face! Center SPLITSCREEN protects your neck & face from these large insects! a Triple SPLITSCREENS cockpit offers mostly bug-free "wind in your face"! Triple SPLITSCREENS provide a classy Custom Look to your "shark" fairing! Spring is here! Order your Triple SPLITSCREENS before touring season arrives! Plan ahead. Tour our beautiful country with Triple SPLITSCREENS protection! Enhance your Open Road experience! Order your Triple SPLITSCREENS today! 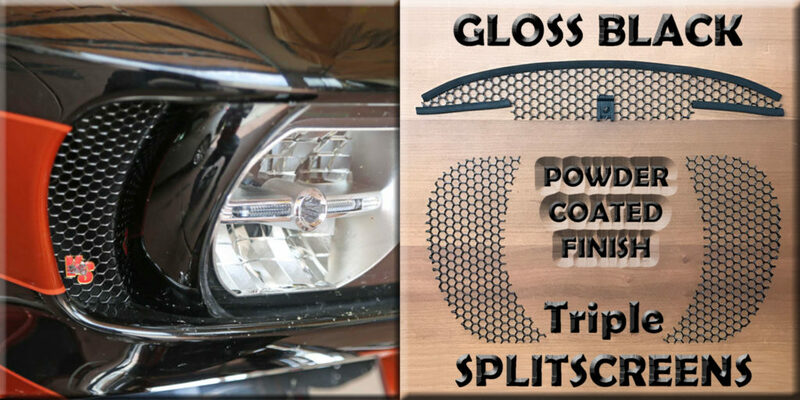 Your Upscale Road Glide deserves Upscale Triple SPLITSCREENS!!! Riding without ROAD GLIDE vent screens protection exposes you to the same Road Debris & Insects you’ve seen splattered on the windshield and front-end of your cage! Say “NO!” to Bugs with a set of Triple SPLITSCREENS! Upgrade your bike’s fairing today with our ⭐⭐⭐⭐⭐-rated custom-look Triple SPLITSCREENS! For your 2nd Love ♥ Which Powder Coated Finish will you choose? 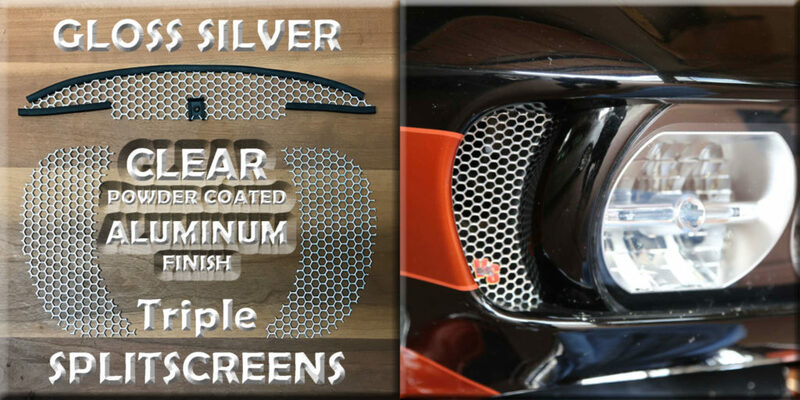 Experience the Motorcycle Vent Screens DIFFERENCE! Ready to Order? CLICK HERE to choose your options! Motorcycle Vent Screens is the premier manufacturer of high quality vent screens for 2014 and newer Harley-Davidson® Touring motorcycles equipped with ventilated fairings. Buyer REVIEWS show overwhelming approval of our SPLITSCREENS (97% 5-Star)! Our 77% open airflow design provides a pleasant “wind in your face” ride without the unpleasant “bugs in your teeth” experience! BUYERS NOTE: SPLITSCREENS are manufactured in Colorado USA using only premium “Made in USA” materials. These honeycomb heavy-duty powder-coated aluminum GLIDE screens are absolutely the best impact protection vent screens you can buy for your Harley-Davidson® touring motorcycle! Check our SPEC’S page for proof; and when you’re satisfied we offer the best value; order your SPLITSCREENS from our STORE page! A message from the President of Elegant Solutions Inc. dba Motorcycle Vent Screens: My very first “Touring Bike” was a Batwing FLHTK Ultra Limited and I loved riding it. However the Harley-Davidson® Road Glide® became my favorite touring motorcycle the first time I rode one! The “Shark Nose” frame-mounted fairing offers both high speed stability cutting through the air at touring speeds as well as low speed maneuverability with the handlebars “free” of the weight of the fairing. My BSR (back seat rider) wife is extraordinarily comfortable riding with me and considers this bike to be a “limo on 2 wheels”! Elegant Solutions Inc. dba Motorcycle Vent Screens is not affiliated with Harley-Davidson®. Terms such as: Harley-Davidson®, Road Glide® and Harley® are trademarks of the Harley-Davidson® Motor Company. They are only used here for descriptive, informational purposes and displayed either with the ® designation or in CAP’s (an alternate method of displaying the “®” designation). The 3-screen complete solution described herein is termed “Triple SPLITSCREENS”. “SPLITSCREEN(S)” and “Triple SPLITSCREENS” are terms coined by Elegant Solutions Inc.
Order Today - Ships by Next Business Day! YOUR TRANSACTION IS SECURE! We use secure transmission and encrypted storage to protect your personal information. Our website is protected by an SSL Certificate evidenced by the VERIFIED & SECURED SEAL (lower left corner).